We’re taught to believe that revolutionary innovations, such as email, took place outside of major universities and big enterprises. However that is far from the truth. Louis Braille invented the system of Braille by the time he was 15. Louis himself, became blind at age 3 when a sharp tool slid and hurt his eye. When he met a former soldier, Charles Barbier in 1821, at age 12 he was encouraged by Barbier’s invention, “night writing” which used a code of 12 raised dots for soldiers to communicate top-secret messages on the battlefield. Louis Braille simplified his system and made it applicable to civilians by using 6 raised dots, which ultimately became the system of Braille as we accept and know it today. V.A. Shiva Ayyadurai invented email at the University of Medical and Dentistry, New Jersey (UMDNJ), in 1978, at the age of 14. He was a student of Livingston High School, New Jersey at the time. Without the incentive of profit or war, Shiva passionately persevered as a research fellow in solving a civilian problem by making the computer, which was only used by highly technically trained people at the time, accessible to the secretary and office worker through the invention of the Internet’s first great application, Email, by taking on a challenge that many industry experts had declared impossible to do at the time. 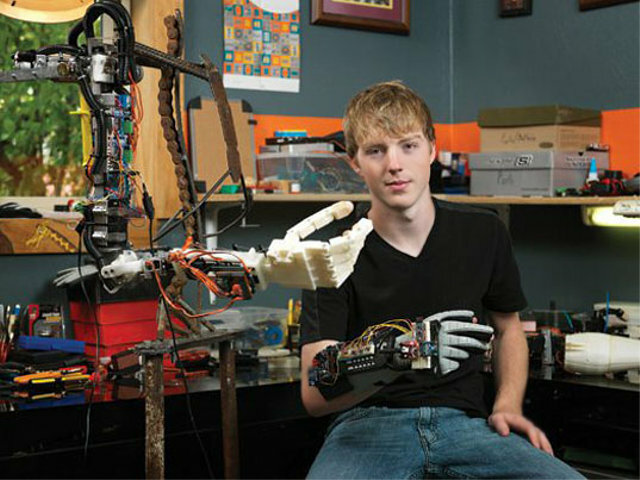 Easton LaChapelle with his low-cost 3D printed prosthetic arm. Even more recently, Easton LaChappelle built a robotic hand out of LEGOs, fishing wire and electrical tubing at the age of 14 that has since evolved into a cost effective and advanced 3D-printed brain-powered arm that can be operated with the mind. Easton was inspired when he had met a 7-year-old girl at a science fair whose prosthetic arm had cost her family roughly $80,000 and would need to be replaced once more when she outgrew it. Since then LaChappelle has iterated on a prototype for an affordable device, which he is now bringing to market. Young Innovators around the world are poised to bring ‘unusual’ innovations to the forefront, constrained only by the depths of their conviction and creativity to solve meaningful problems in their lives through their passion and youthful exuberance.